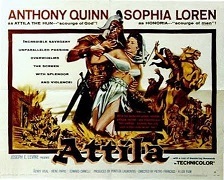 Attila (Anthony Quinn), the leader of the barbarian Huns and called by the Romans "The Scourge of God", sweeps onto the Italian peninsula, defeating all of the armies of Rome, until he and his men reach the gates of the city itself. Also stars Sophia Loren and Henri Vidal. Also with Claude Laydu, Irene Papas and Colette R�gis. (In Italian language, with English subtitles).